It’s time to fire up the grill and make this delicious Chilean Steak Sandwich, aka Chacarero. No grill? Don’t fret! You can make this at home with a cast iron pan. Chileans love their bread and they eat it daily. The country consumes more bread than any other country (with the exception of Germany), averaging around 458 pounds per household per year. No wonder they have some of the most amazing sandwiches in the world, like the Barros Luco, the Choripan, the Lomito and, yours truly, the Chacarero! In fact, the Chacarero – which is a steak sandwich topped with mayo, tomatoes, green beans and a drizzle of hot sauce – is so delicious that it made the list of “The 13 Most Amazing Sandwiches the World Has to Offer”, according to the Time Magazine. Yep, it is pretty damn good and if you haven’t tried it and you’re into insanely delicious sandwiches, you absolutely must. The good news? A trip to Santiago isn’t necessary, because you can make this tasty sandwich at home! ? Now, you can probably find a hundred and one different versions of this sandwich on the internet, and even at restaurants. The formula (bread + steak + tomatoes + green beans) is the same, but people use different types of meat, bread and condiments. I chose to use a flank steak, which I seasoned with Badia spices and grilled to perfection using my cast iron pan. Tim has been talking about getting a portable charcoal grill that we could take to the park when it’s nice out, but that hasn’t happened yet, so this apartment girl has to make the magic happen with a good old cast iron! While the results are up to par with a steak grilled in an outdoor grill, I’m still perfecting my technique in the “smoking the whole apartment” department. We do not have an exhaust fan so I’m always worried I’m going to set up the fire alarm or get one of my super strict neighbors to come knocking on my door to complain! I’ve recently learned to use a high smoke point oil – like grapeseed oil – instead of olive oil, which has a low smoking point, and that has helped quite a bit. If you have any more tricks that you would be willing to share with me, please comment below and let me know. Smoking the whole apartment hasn’t stopped me from cooking steaks before, but I would love to make it less of a hassle! As for the bread, Chileans usually use frica, which is a lighter and round roll, for their Chacarero sandwiches. I wasn’t able to find it here in New York/New Jersey, so I ended up settling for these gorgeous Portuguese rolls that I saw in the store. You can use whatever type of roll/bread you fancy. Even burger rolls would work here! Now as it’s the case with every other sandwich out there, please look at this recipe more as a guide than an actual “must follow exactly” recipe. 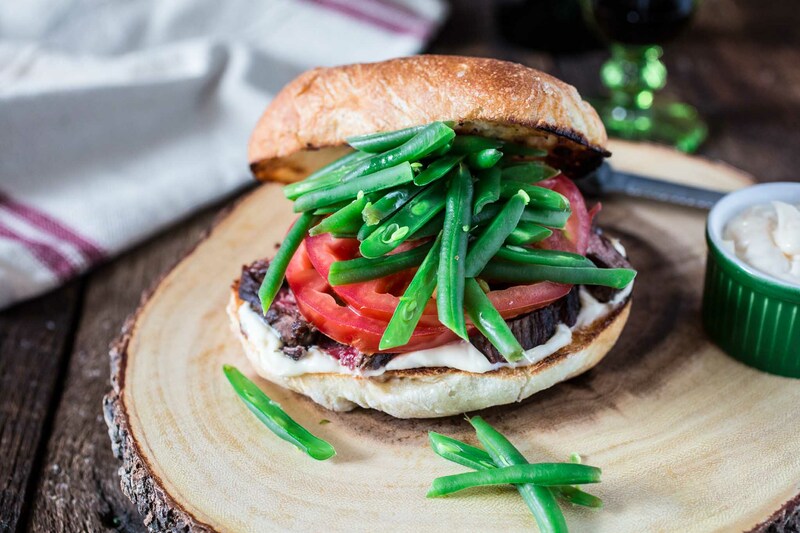 Because one sandwich is not like the other and some people like to top their Chacarero steak sandwiches with an insane amount of green beans… ??? … while others just want a touch! 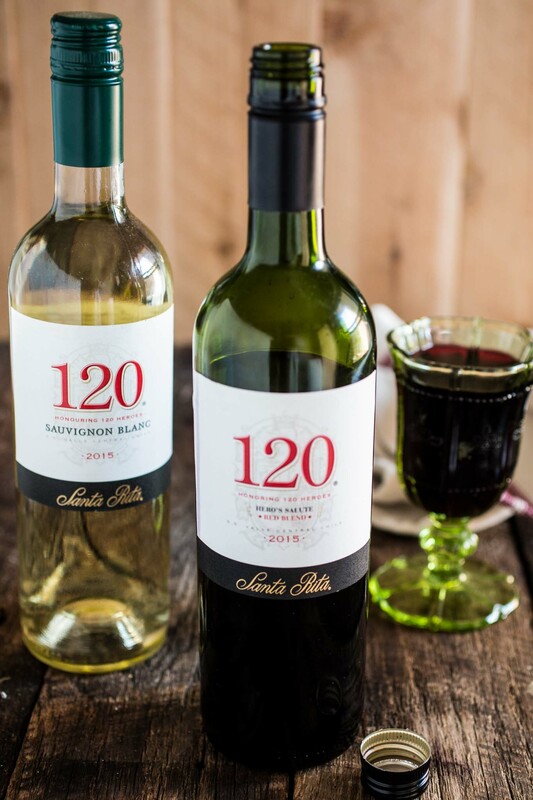 Once your sandwiches are ready, all that will be left to do is open a bottle of Santa Rita 120 Hero’s Salute Red Blend to enjoy with them! Because Chilean food asks for Chilean wine, don’t you think??? 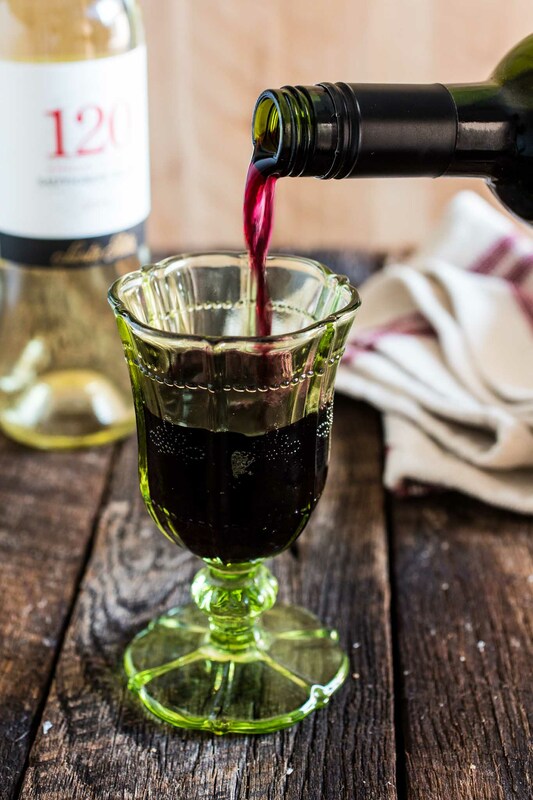 Chilean wine is one of my favorites, and I’ve been drinking Santa Rita since I was of legal drinking age in Brazil. An over the top steak sandwich paired with delicious wine? I seriously can’t think of a better way of celebrating summer! 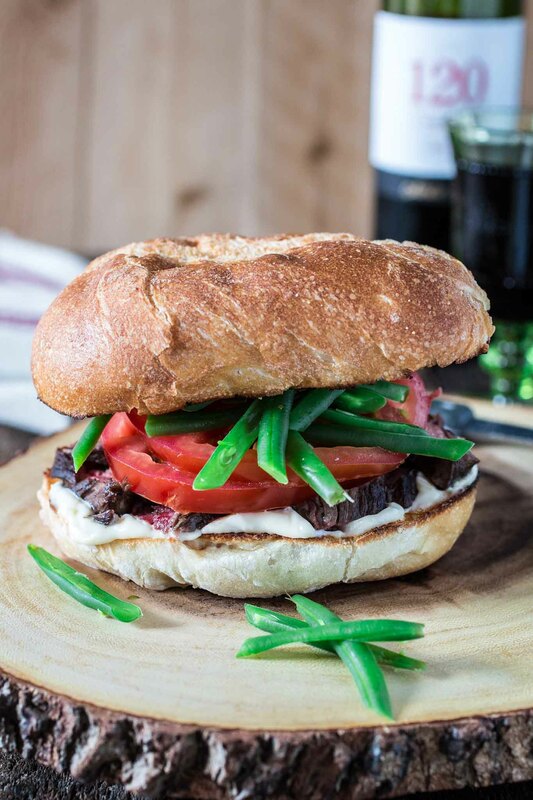 Not to mention, this would be a great steak sandwich to make for your dad for Father’s Day. I know that because the first thing I told Tim, when I first bit this sandwich, was: “My dad would be so proud of me!”. Sadly, my dad is back in Brazil and I’m in the United States. But the next time we see each other, I can guarantee he will ask me to make him one of these. I might get him to grill the steak though, because my dad kills at the grill! Bring a large pot of water to boil, over medium high heat. Once boiling, add salt and then the green beans. Cook for about 5 minutes, until tender but still al dente, drain and transfer to an ice bath (a bowl filled with water and ice) to stop the cooking process. Drain and reserve. Season the steak with the seasoned salt. Grill steak in an outdoor grill or in a cast iron pan indoors at high heat for about 4 minutes on each side or until medium rare. Transfer to a cutting board and let it rest for at least 5 minutes. Then, slice thinly against the grain. To assemble the sandwiches, spread the inside of the rolls with mayo. Layer with steak and then top with sliced tomatoes, green beans and some dashes of hot sauce. Close the sandwiches with the top rolls and serve! 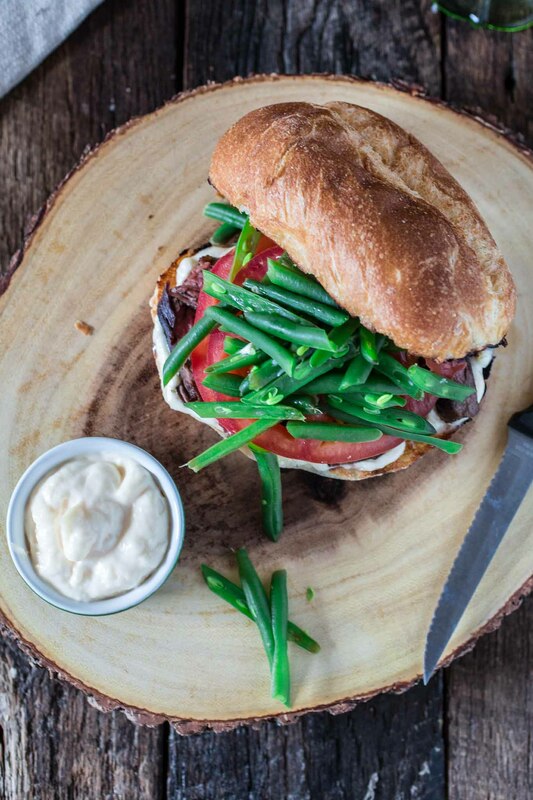 This steak sandwich recipe looks so delicious and fresh! Perfect wine pairing! I can just picture eating your sandwich now with a big glass of red wine – beautiful comfort food, great recipe! I’ve never thought of putting green beans on a burger or steak sandwich but I’m really tempted looking at your gorgeous photos. These sound absolutely delicious. Hungry Hubby would be delighted if I made these for him! When l first moved to the UK, l was amazed by the large number or sandwich shops and how lunch time, especially for working people, would mainly consist of a sandwich, a pack of crisps and a drink. I got to love eating sandwiches too, and yours is beyond delicious. Although there are endless possibilities of making a sandwich, we do get stuck sometimes with the same favourite ingredients. You gave me a great idea now. So delicious! Eesh, everything about this meal looks utterly perfect! Perhaps I could wangle an invite next time you fire it up…??! Such a lovely summer sandwich! I never have tried green beans on a sandwich before and definitely must. Love how vibrant and fresh this is! Unusually delicious looking. I mean it’s literally a plate stuffed in a bread bun…. I want it all now! So tasty and inviting and I’m sold. 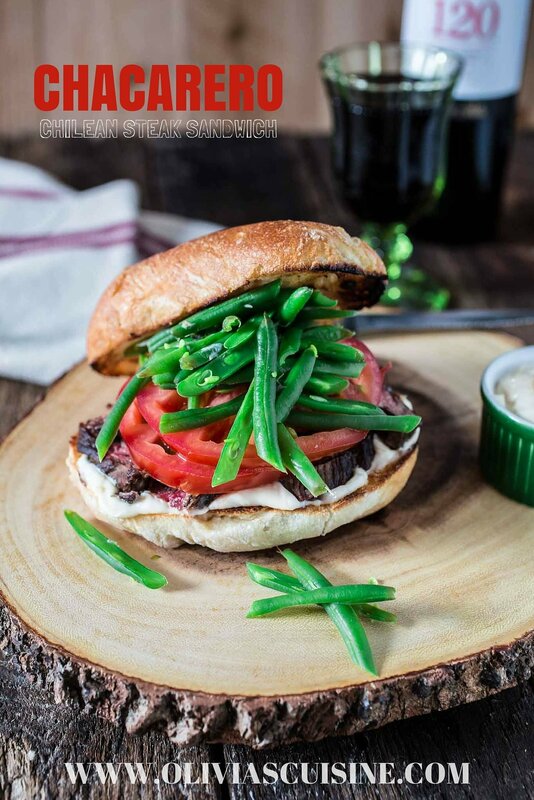 Green beans in a sandwich, love this. So, we went to “El Domino” in Vina del Mar unfortunately we were very disappointed because the beans were almost row, not cook and icy cold, we sent them back, they said that this is the way they do in now.